SOFFRI has been supplying and wholesaling since 1989. As we value our customer we always offer high quality products and services. We provide high quality products at affordable prices. Selling direct in bulk gives our customers premium shop quality at a much lower cost. On our website you'll find extensive range of flags, buntings flags, hand flags, line flags, flags pole, table flags and other miscellaneous products that are high quality but without the hefty price tag. We also do supply great quality of towel. Towels are an essential bath accessory required to wipe and dry the body. According to preferences the quality of towel can vary. There are people who might like fluffy towels while others prefer super-absorbent and quick-drying ones. The quality of a towel heavily depends on its material. Cotton is famous for its softness and durability. We also do supply a wide variety of types, qualities and sizes of bed sheets, blanket, pillow case & mattress for uses including hospitality, health care and remote work sites. We supply inexpensive sheets and pillow case for a few uses and luxurious durable soft bedding for high end spas, hotels and resorts. Most of our bed sheets and pillow case are in stock, and we can also provide you with custom made sheets upon request. ​All of our Malaysia Flags, States Flags, World Flags or custom made flags are sell with great values and premium quality. Using nylon, cotton, polyester or paper, we always listen to your needs and as​sist you to choose the right medium before buying​. We will keeping your options completely open. We also meet the demands by offering extensive range of products such as buntings, line flags and flagpole. Quality of the poles are fabricated from aluminum, carbon steel and stainless steel. This coming 16th September is national public holiday to celebrate independence day or known as Malaysia Day. Express your patriotism and love towards country by raising Malaysian flags. Yes ready stock available here. - Always wash bath towels for the first time before using them. - Don't use fabric softener as it will decrease the towel's ability to absorb water. - If you can, put your towels out on the line to dry to give them extra freshness. Driers are also great for adding extra softness. Don't iron towels as this can make them stiff and scratchy and also make them less absorbent. ​Give your bedroom an instant update with our bed sheet, duvet, blanket and soft pillow case. From luxurious bed sheet to soft pillow case, you'll find soothing essential to suit every bedroom. Our bed sheet, duvet, and blanket comes in a range of bed sizes from King, Queen to Single and it was manufactured from our factory and specifically ideal for hotel, motel, home stay, chalet and others. The products quality was measured by the number of washes before the fading of color, shrinkage and durability. All these parameters have been taken into account in producing these products. 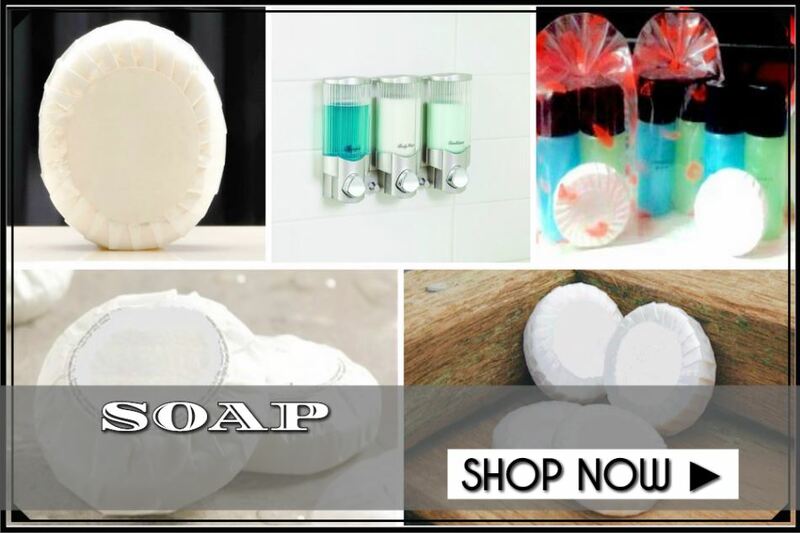 Browse our huge range of soaps, shampoos, body lotion and shower gels providing everything you need to offer great complimentary bathroom products. It is full of high quality products and guest will be thrilled to take home. The ingredients are delightful fragrances that are easy on your nose. All these soaps, shampoos, body lotion and shower gels are safe for the environment and human body. So take a look and if you have any questions just give us a call. We are at your service. ​Soffri reached out to hotels around Malaysia by supplying luxurious amenities guests can enjoy. Wide selection of hotel items such as shower cap, slipper, sewing kit, laundry bag, razor, toothbrush, toothpaste and others that suit from small to large hotel groups. We maintain provide high quality standard while remaining very competitive priced. We do as well provide customisation for those who are looking to have their own products designed with corporate branding. Our own philosophy always exceed customers' high standards. This is not just first impression but it is to create lasting ones by building a relationship based on understanding of your requirement. ​Over 27 years Soffri have been in the sewing industry since 1989. Soffri has established a reputation for reliability, quality and support for the customers in Malaysia. The business has grown steadily and now Soffri are the manufacturer for bed sheet, blanket, curtain, pillow case, napkin, custom made flag, table cloth, chair cover, uniform, and many more. 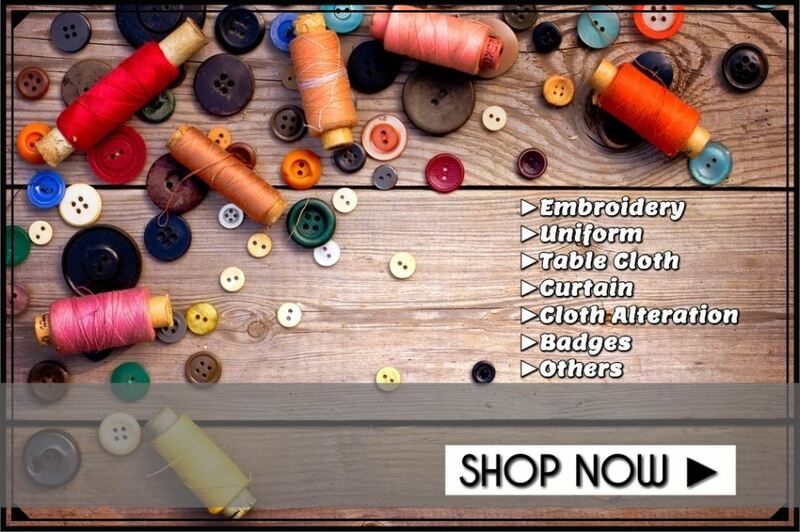 Soffri also provide service for embroidery with the logo of the customer's company. Soffri able to personalize the towels, flags, table cloth and others through embroidery with company name or logo. Soffri have the team that can help customers to make your company logo completely unique. Jalan Ampang Utama 1/1, Taman Ampang Utama, 68000 Ampang, Selangor.